Electric Linear Actuator Systems for Feeding Automation Equipment | Venture Mfg Co. The continual growth and success of the farming industry can be attributed to the use of automated equipment in many applications. One application that has benefitted immensely is animal feeding processes. Automated feeding equipment is used to reduce pressure on farmers when feeding farm animals. These equipment utilize linear movement to perform the automatic feeding process. Venture Mfg. Co. provides linear actuators to meet the requirements of feeding automation applications. Most of the actuators mentioned here are designed with DC gear motors. The use of this type of motor provides smooth and precise motion without excess power consumption. These actuators are capable of handling a range of load capacities, from 500 to 7000 lbs. Customers from the farming industry can gain a variety of benefits by choosing our actuators for feeding automation. These actuators are designed with lifetime lubrication. This feature helps provide smooth motion without maintenance for long periods of time. They can be designed with limit switches, which can be useful to ensure that only the exact amount of feed is provided to the animals. 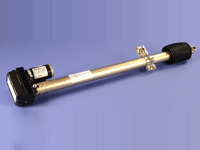 We can manufacture the actuators with steel tubes and zinc plates. The use of these metals provide benefits of easy maintenance, and product durability. Our electric linear actuators can be used in extremely harsh environments. They are resistant to moisture, corrosion, and weather elements. The combination of the ball screw design and DC motor enhances the performance of DC motor linear actuators immensely. We design all the above mentioned products as ready-to-install systems. This saves customers saves immense time, and allows them to immediately begin reaping the benefits of the actuator systems. Venture Mfg. Co. can provide a range of electric linear actuator systems for feeding automation. 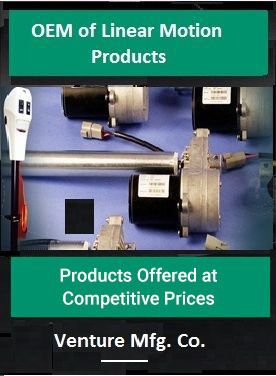 We can even create custom actuator products to meet specific application requirements.